You hit the open road on your motorbike one bright morning. You weave through traffic and take in the scenic views. You breathe the crisp air and let the breeze ruffle your hair. But, sadly, things start to go wrong. Perhaps your engine won’t start or your tires blow. Maybe rain starts to fall, you skid on a wet patch and your bike ends up too damaged to ride again. What do you do? Just pick up the phone and call Walnut Creek’s Shield Towing! We have years of experience providing customers across the Walnut Creek area with professional motorcycle towing services. Our team is committed to treating your bike with the care and respect you expect, towing it with the utmost safety. Shield Towing – Professional Towing Company! Your bike can experience mechanical problems at any time, any place. Even if you’re a cautious driver and you take good care of it, you may still run into a rare issue. Shield Towing knows it’s no fun being stranded at the side of a road in the middle of the night. Nobody wants to be left helpless in a strange neighborhood. It can be frustrating, upsetting and ultimately cause massive disruptions to your schedule. We understand. You have places to be and things to do. That’s why we’re here for you when you need us — 24 hours a day, 7 days a week. 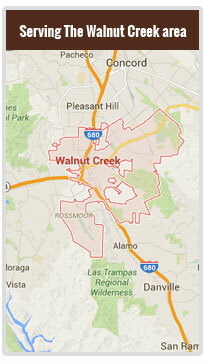 Our team of licensed professionals prides itself on fast response times, and one of our experts will be with you as soon as possible no matter where in Walnut Creek you are. As each of our tow truck operators is local, they know the Walnut Creek area well: they’ll find the best shortcuts and quickest routes to arrive on the scene with minimal delay. The last thing you want to worry about when your motorcycle gets towed is money. You want to know your bike’s in the hands of specialists and you’re paying a fair price. At Shield Towing, we’re dedicated to maintaining a reasonable pricing model: the rate we specify in our free quote is the rate you’ll pay. No hidden charges. No extra fees. No nasty surprises. Just affordable prices for motorcycle owners on all budgets. This helps you to stay focused on getting your bike towed and back on the road without stressing about high rates or being stung by undisclosed charges. It’s a transparent system — and we’re proud of it. A Qualified Team You Can Trust! Each of our technicians is licensed and bonded, providing exceptional service you can trust. We treat each call as unique and focus on your complete satisfaction every time. Shield Towing makes sure all of our technicians are trained to the highest standard and are equipped with cutting-edge equipment. We’ll prepare your motorcycle for towing with real care and consideration for your property. Want to know more about our motorcycle towing services? Have questions about our prices or our response times? Please don’t hesitate to give us a call on (925) 397 – 0960!